charter with dr dive to the uss oriskany, pensacola beach's premier dive site. sunk in 2006 as an artificial reef, from its first day on the gulf floor, it has attracted thousands of divers, many who come back again and again. the uss oriskany was launched 13 october 1945. while still incomplete, her construction was suspended on 12 august 1947. she commissioned in the new york naval shipyard on 25 september 1950. the uss oriskany entered the shipyard for overhaul on 1 october 1956. she decommissioned there 2 january 1957 for modernization work that included a new angled flight deck and enclosed hurricane bow. new, powerful steam catapults were installed by the puget sound naval shipyard, bremerton, wash. this gave the ship her current deck configuration and prepared her for modern jet fighter service. during 1964 her flight deck was used to test the e-2a hawkeye, the navy's new airborne early warning aircraft. she also provided orientation to senior officers of eight allied nations. between 10 may and 6 december 1965, she carried out over 12,000 combat sorties. in october 1966, the uss oriskany suffered a major fire while operating off vietnam when a fire erupted on the starboard side of the ship's forward hangar bay and raced through five decks, claiming the lives of 44 men. many who lost their lives were veteran combat pilots who had flown raids over vietnam a few hours earlier. the uss oriskany had been put in danger when a magnesium parachute flare exploded in the forward flare locker of hanger bay 1, beneath the carrier's flight deck. her crewmen performed fantastic feats in jettisoning heavy bombs, which lay within reach of the flames. other men wheeled planes out of danger, rescued pilots, and helped quell the blaze through three hours of prompt and daring actions. the uss oriskany was decommissioned on september 30, 1975. she was stricken from the naval vessel register in july 1989, and sold for scrapping on september 9, 1995. the contractor defaulted and the ship was repossessed by the navy, with the contract terminated on july 30, 1997. the ship spent the following years at the beaumont reserve fleet in beaumont, texas. she was sunk as an artificial reef on may 17, 2006 off pensacola, fl, the cradle of naval aviation. the ship lies in a n-s orientation with the bow of the ship pointing south. the superstructure of the ship rises 55 feet above the flight deck, which towers an additional 77 feet above the hard sand bottom at 212 fsw. the "island", or control section lies on the starboard (west) side of the flight deck. the bridge of the ship, where ship steering and maneuvering controls were located, is on the forward (bow facing) end of the island at approximately 120 feet. (there are actually two bridge decks on the oriskany.) the flight control deck, where the flight control officer would oversee take off and landing activities on the flight deck, is on the aft (stern facing) end of the island at approximately 100 ft.
the flight deck stretches the full 911 feet of the ship's length and permitted simultaneous launch and recovery of the jets, planes, and helicopters carried aboard the uss oriskany. the flag bridge (battle group commanders bridge) faces forward and is the lower of two bridge deck structures from which command activities were carried out. the characteristic protruding windows and distinctive arc shape distinguish the flag bridge from the captain's bridge. this bridge would have been occupied during active operations and activities there focused on carrying out the immediate operational mission. the captain's bridge (or conning bridge) rests above the flag bridge and was the command center of the ship during all operational activities. similar protruding windows show an angular corner to the flight deck and an elegant sweep to starboard, providing visibility outboard for docking and maneuvering. the "mighty o" sits 25 miles offshore. the magnitude of this ship is simply breathtaking. while this is a new site, the sea life have discovered it. to date, we have seen puffer fish, barracuda, snapper, red fish, amberjack, cobia, tuna, and shark. many reef fish have found their way to the "o", just waiting to be discovered. this is a site for the more advanced diver and technical divers. proof of experience will be required for passage to this dive site. guided tours are also available with a dive master for this site. 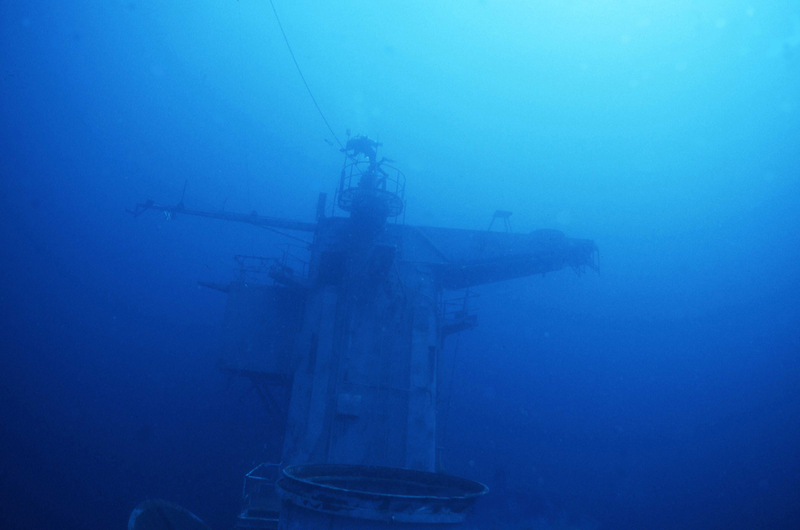 the uss oriskany is considered an experienced dive environment. advanced certification is not required; however, experience beyond the minimum required dives for scuba diver certification is necessary. adherence to local, consensus requirements is necessary to maintain safety, reduce risk to the diver and the local emergency response system and ensure continued high value training and dive experience opportunities at this unique site. requirements include an advanced certification card and log book (in possession on boat), 20 logged dives, 2 of which are in the last year. open water divers and those not meeting the above requirements can still enjoy the oriskany. contact captain jim on how to set up a dive master to accompany you, or how to complete a refresher course.